Eltronicschool. - This is one of instrument circuit schematic that called with universal battery tester using TL072CD IC shown look like in Figure 1 below. 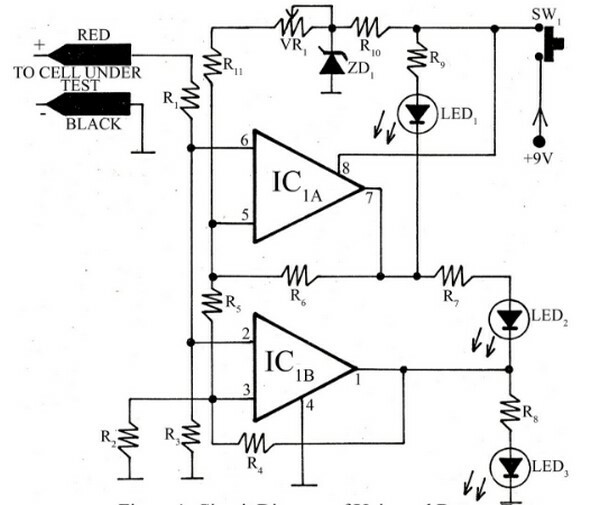 The main component to make this circuit is TL072CD as voltage comparator. Beside we will give you electronic circuit schematic of Universal Battery Tester using TL072CD and component parts, we also will give you global description about this circuit that we get from other site. Circuit schematic like in Figure 1 above is Universal Battery Tester using TL072CD. This circuit build with the goal to recognize the battery whether it is working or not is very difficult. Generally voltmeter is employed for checking purpose of state of battery. Now, here is very simple circuit utilized to check the state of battery. According Electronicsproject site that the entire circuit of universal battery tester is build around dual comparator IC TL072 (IC1) followed by other component. The two independent comparator is used here as operational amplifier. The inverting pin of these two operational amplifiers is fed through potential divider network made from resistor R1 and R3. Rest of the component is utilized to maintain threshold voltage.